We design and manufacture High-quality Guitar Flight Cases to transport, store and protect a wide range of guitars. We have cases for electric, acoustic and bass guitars all available. Contact us to discuss your requirements. When it comes to keeping your guitar protected during transportation to gigs and concerts, you’ll want to be sure that you choose Absolute Casing as your equipment protection Roadie! We supply custom flight cases to suit the most unique shapes and sizes, so you needn’t worry about finding something suitable from our extensive collection of guitar flight cases. 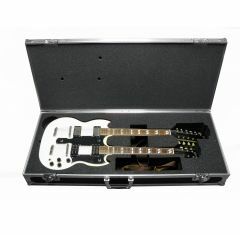 The guitar flight case is perfect for transporting your instruments to events safety. Each of the cases we provide at Absolute Casing is made from the highest quality materials, ensuring that you receive the best value for money. Our guitar case rack is ideal if you have a wide range of guitars to transport, providing a reliable way to carry your instruments, and making sure that there is no compromise to their quality. Guitars can easily become damaged and scratched if they are not protected. To prevent the guitars from damage associated with transit and various pressures and impacts, invest in our guitar case rack today, not only will it save you money but it will make transportation more convenient. When playing on stage, you need your instruments to look professional and well-maintained, don’t let transportation spoil the appearance of your guitar. We supply custom foam fittings and inserts to help protect your guitars from any knocks, allowing you to have full peace of mind. If you can’t find exactly what you’re looking for, don’t hesitate to get in touch with our team of experts by calling 01635 579 518 or by emailing sales@absolutecasing.co.uk, who can help you design and manufacture a bespoke custom flight case to suit your guitar!